Imagine a closet stuffed to the brim with bridesmaid dresses. Poofy skirts, sleek outlines, and themed elements—they’re all there. The closet doors won’t even close! If you’ve ever seen the movie, 27 Dresses, then you’re already laughing at the memory of all those dresses. 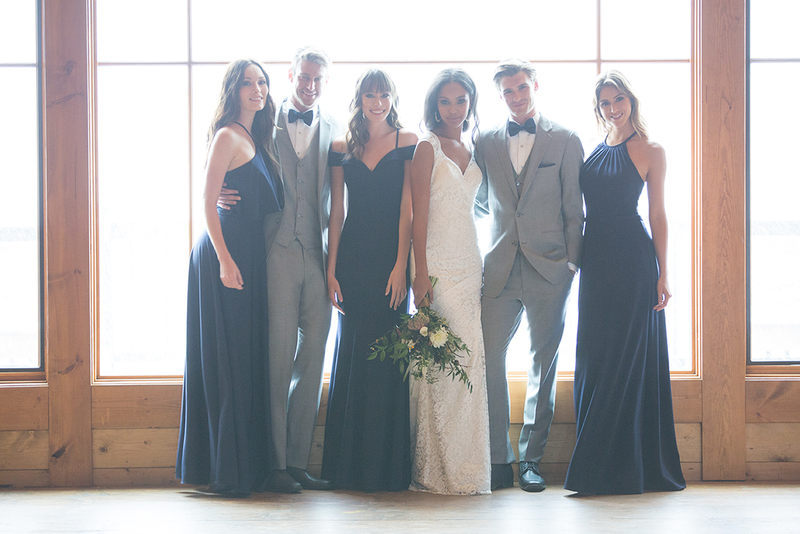 If you’d rather not have your bridesmaids harboring dresses (they secretly hate) in a closet, then it might be time to consider the option of mixing and matching bridesmaid dresses for your upcoming nuptials. Not only is it a way to allow your girls to add a little style to their dresses, but it also lets you customize your wedding party’s look. Mixing and matching bridesmaid dresses is actually a current trend taken by many a modern bride-to-be. The mix-and-match approach to bridesmaid dresses first started among celebrity brides. Model Molly Sims went with mixing and matching on choosing her bridesmaid dresses, by varying patterns, dress styles, and color tones. To get you started, the Molly’s Bridal team will let you in on their bag of mix-and-match tricks. Trick #1: Pick out different dress styles that are all the same color. This trick lets your bridesmaids find dresses that flatter different body types. The photos will have a cohesive aesthetic, as an added bonus. A word of caution: don’t ask for a color and leave it at that. In other words, don’t announce, “Let’s do blue dresses!” in a group text and expect everyone to match on the morning of. Instead, ask for a specific tone, and you’ll end up with better results when the wedding party gets together for photos. See Trick #4 for a tip on how to get your bridesmaids on the same page. For more tips, visit the Molly’s Bridal bridesmaid department in store! No appointment necessary. Different dress styles also give your bridesmaids the room to make a selection based on personal preference. If one of your friends just loves a particular style, they can still wear that dress to the wedding. All you have to do is make sure that the tone fits in with your color scheme. Trick #2: Stick with the same dress style, but change up the colors. Another trick is to find a bridesmaid dress style that you really like, but offer your bridesmaids several choices on colors. That way, your girls can wear their favorite color! Also, if they look best in a particular color, they have the choice to pick out a dress in that color. Trick #3: Outfit the bridesmaid squad in shades of the same color. This trick plays off the idea in Trick #1 (Pick out different dress styles that are all the same color). In this trick, you can decide on a particular color, like purple, but allow your bridesmaids to each select a dress in that shade. The color palette will be appealing and attractive, but you can give the overall look some more style! It might be a good plan to create a Pinterest board to show the shades of the color you want. When your girlfriends start asking what exactly you want, you can point them to the board you created! It’ll help smooth out the dress shopping process just a bit (and who doesn’t want things to run smoothly in wedding planning?). Trick #4: Set your MOH apart by selecting a different dress. Everyone knows that the maid-of-honor (MOH) is the BFF to the bride-to-be on all things wedding. She’s there to share your tear-filled joy, with an understanding smile and a travel size Kleenex. She’s there in your stressed moments, to talk you through it and write out a new to-do list. Why not honor her on The Big Day? 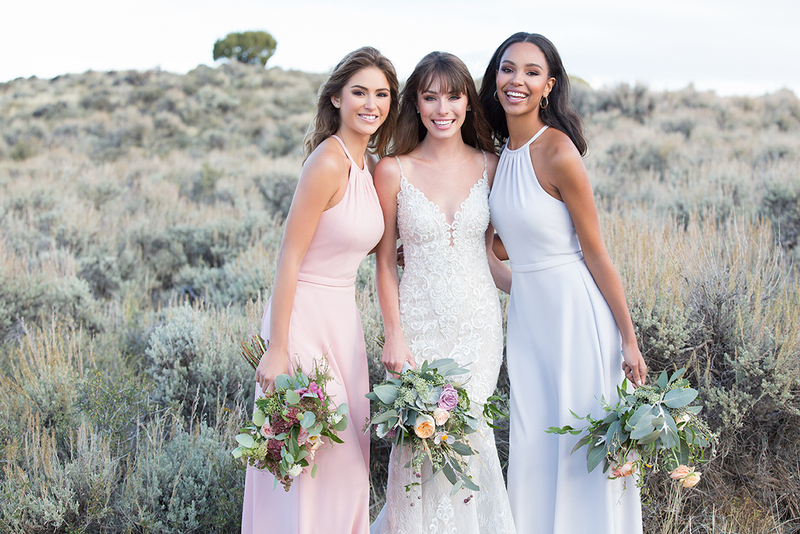 In this trick, you can choose a dress for your MOH that’s different from the rest of your bridesmaids. It can be as simple as changing the shade of the dress (like in Trick #3) or the dress style (like in Trick #1). You could even make her dress a darker or lighter shade than the other bridesmaid dresses. Do you feel inspired yet? Mixing and matching bridesmaid dresses can be fun and creative, especially with your squad chiming in. The stylists at Molly’s Bridal are dedicated to bringing your vision for an amazing wedding to life. They know that part of that vision is making your girls feel beautiful, too. 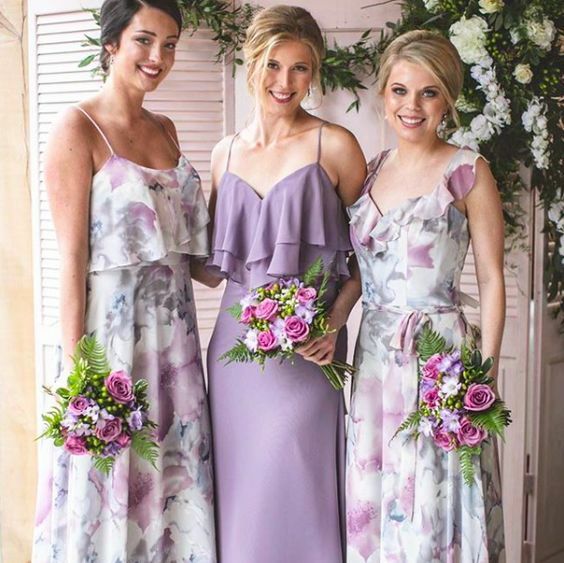 You can come in to the Molly’s Bridal location to look at bridesmaid dresses, or you can shop online for bridesmaid dresses at your own convenience. If your girlfriends live across the country or you have a large wedding party, then online shopping is an easy way to check off bridesmaid dress shopping. Ready, set, shop!